Porcini Mushroom Risotto Mix (250g) Made with superfine Carnaroli rice and Porcini, this is a tasty and easy to prepare meal. Just add some olive oil and follow the simple instructions. Trofie Pasta (500g) Trofie are fine twirls of pasta which remain have a nice bite to them as they remain quite firm when cooked. They are a traditional pasta shape of the Liguria region and are generally eaten with pesto, another Ligurian speciality. Organic Pesto (180g) Made simply in Liguria with just healthy, natural ingredients – organically grown basil leaves, extra virgin olive oil and pine kernals. Tomato and Aubergine Pasta Sauce (314ml) This is a tasty tomato sauce mixed withaubergine and no added sugar. For a quick and easy meal just heat the sauce gently in a pan and add to some nice quality pasta. Mild Chilli Pepper Paté (180g) This paté is hand made in Calabria by combining delicious local chillies with extra virgin olive oil. Great spread on a bruschetta, in a sandwich or even stirred into tomato pasta dishes. La Cannetta (200g) A delicious creation of sweet white figs and Mediterranean citrus peel. Elegantly packaged in bamboo canes, this is a lovely gift for a sweet toothed vegetarian! Bitter Orange Marmalade (200g) This best selling marmalade is rich in fruit and made exclusively with Calabrian oranges that give it a delicious bitter sweet taste. 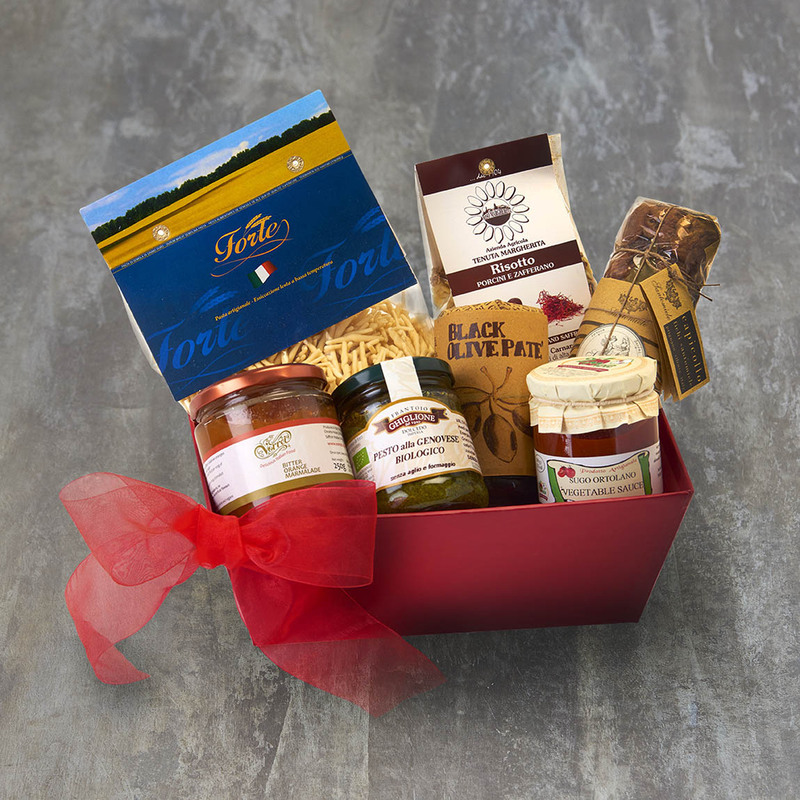 These gourmet veggie goodies are packed in a strong red tray which is tied with a lovely bright ribbon. A gift message option is available for you to send a personalised message. Please note that if we are out of stock of any item we reserve the right to substitute it with the most similar available item. Allergens: wheat, pine nuts, cashew nuts, almonds.